A statue to Beko Ransome-Kuti has been erected, four years after his death. Of course, he was a public intellectual and a hero for human rights. Its wonderful and important that the man is remembered and celebrated in this way. Future generations will be spurred to find out more about his life and achievements. 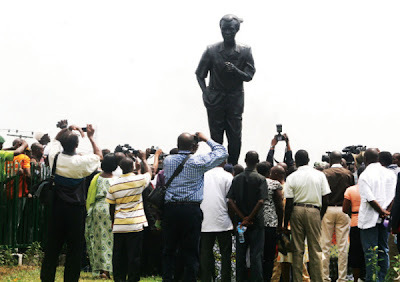 However, I can't help feeling that if there's a statue, why on earth is there not a statue for his brother Fela? Beyond Nigeria, Fela is an icon for struggle against despotic power alongside figures such as Che and Malcolm X. While Beko played a solid role in keep the candle flame against injustic alight, Fela will surely be remembered for centuries to come for creating the conflagration. This is not to pitch the two dead brothers against themselves; its simply to wonder why Fela has yet to be commemorated in official public consciousness like his brother has just been. I suppose its only a matter of time. If Governor Fashola did it before the elections, I think he'd win Lagos again, whichever party he came under. Do not forget that a lot of Nigerians, especially the religious hypocrites will not let this happen as Fela was seen as morally bankrupt because of his open use of weed and the many wives he married. His message was drowned in the minds of many by this. Celebrating him to them is celebrating his lifestyle. Moreover a prophet is not respected in his country. A start will be for the art community to honour him in some form and have followers do a media blitz to emphasis his message. Fela alongside Che and Malcolm X - I don't think so.